Adele has posted a message of support for her best friend who’s recovering from postpartum psychosis. 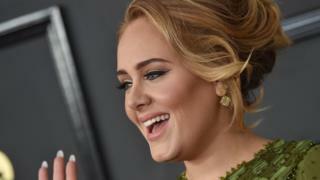 Laura Dockrill gave birth to a baby boy who is Adele’s godson, in February this year. She’s since battled against the condition which can lead to hallucinations and confusion, soon after giving birth. Adele says her story is ‘intimate and heartbreaking’ and a charity has praised them for speaking out. Adele says she and Laura have been friends since they were teenagers and her song ‘My Same’ from the album 19 is about her. The singer has posted a link to Laura’s story, which has been written for a parenting blog. In it she talks about a ‘horrific’ labour which her doctor believes might have triggered the illness. After coming home with her son, Laura describes the feeling of having fallen out of love with her life and not knowing how she would ever change that. She says that her skin went pale, she couldn’t eat or drink and she even started getting severe anxiety attacks. As things got worse, Laura even accused her partner Hugo of kidnapping their baby. Laura was eventually hospitalised and spent two weeks away from her son. She struggled to recognise herself and says ‘suicidal thoughts’ became normalised. She now describes herself as recovering more and more each day and is ‘happy confident and strong’ after getting support from family, a psychiatrist, medication and psychotherapy. “Postpartum psychosis is a particularly serious form of mental illness,” according to Vivien Waterfield from the charity Home Start. “We think that it’s often very difficult for mums to talk about the difficulties they’re having. The NHS describes postpartum psychosis as a ‘serious mental illness that should be treated as a medical emergency’ and advises seeing a GP immediately if you think you, or someone you know, may have developed symptoms.